It is clear that the release of AMD’s new line of processors will be one of the biggest PC gaming hardware events of the year. This is because it’s the first time in years that technology company AMD will truly be challenging Intel in the processor market, as AMD’s processors are seen as a budget option for those looking to buy or build a good gaming PC, but they can’t really compete with Intel’s mid-range or high-range offerings. This is about to change though, as AMD already announced that its new line of Ryzen processors will be hitting stores in early March. And what’s interesting about Ryzen is not only that it will offer performance comparable to Intel’s i5 and i7 processors, but as is typical with AMD, it will do so at a significantly lower price. 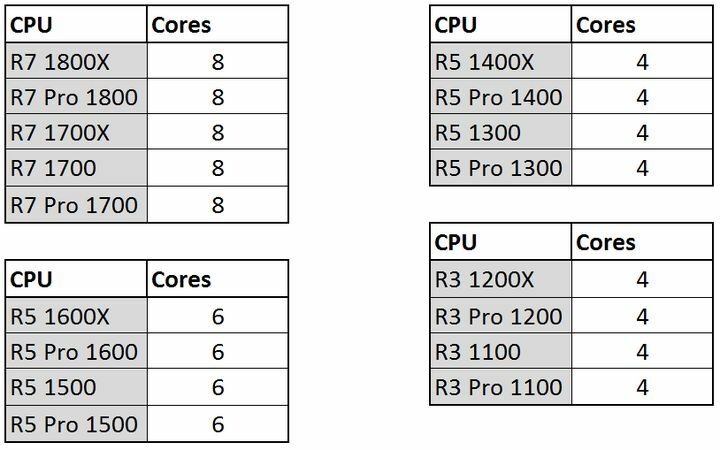 And while we don’t know pricing details for AMD’s upcoming processors yet, data leaked on a Chinese website shows that there will be 4, 6 and 8 core parts, with the lack of a 2 core part being one of the most noteworthy things of the list below. Also interesting is that AMD’s naming scheme will be very similar to Intel’s as there will be R3, R5 and R7 processors, which does seem like a good marketing idea to attract users who are familiar with Intel’s line-up of CPUs. Could this be AMD’s upcoming range of processors? The model names are also very similar to those of ATI cards that were in the market more than a decade ago (particularly the Pro monicker), before AMD bought ATI in order to compete with Nvidia in the graphics card market. Actually, AMD will also be releasing a new line of graphics card models named Vega after the launch of the Ryzen processors this March as company CEO Liza Su revealed earlier this month, meaning this could be a good year for those looking to upgrade their ageing gaming PC. Actually, the PC gaming hardware market is thriving these days and the truth is that the good old PC is certainly becoming an increasingly attractive alternative to consoles when it comes to gaming, while there’s no doubt that 2017 is looking like it could be an exciting year for PC gamers the world over.